Muncie Habitat is taking a more holistic approach to our house building work by focusing more upon neighborhoods. As we know, homes and families are great, but it’s the neighbors and the neighborhood surrounding it that makes it fantastic. As a part of an effort called Neighborhood Revitalization, Muncie Habitat has selected a focus area to begin resident engagement and quality of life efforts. 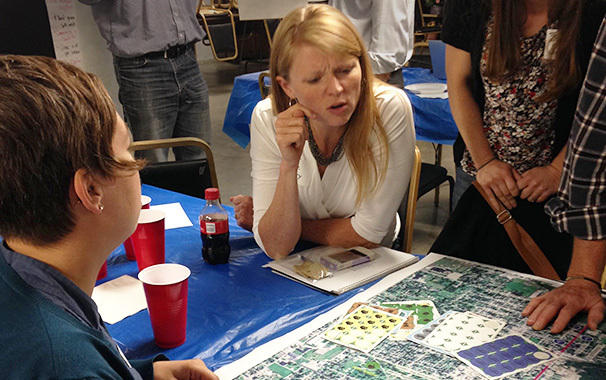 Thanks to a grant from the Vectren Foundation, in the fall of 2015 community residents were engaged in asset mapping and coalition building exercises. From these transformative meetings, the 8 Twelve Coalition was formed. This Coalition is comprised of both residents and organizations who desire to come together to inspire each other to promote a vibrant, authentic, diverse, friendly community that is safe, family-oriented, and that provides opportunities for youth and adults to pursue their dreams. The Coalition’s name identifies the focus area for these efforts – 8th Street to the north, and Memorial (or 12th Street to the residents) in the south. The 8 Twelve Coalition plan focuses on 4 main areas: beautification, services, housing, and business development and employment. Led by residents, the coalition is supported by numerous organizations including: Ross Community Center, Muncie Mission, Urban Light CDC, Inspire Academy, Southview Elementary, PathStone Corporation, and ecoRehab, to name just a few. Thanks to a big boost from Lowe’s Corporation, Vectren Foundation, and Ball Brothers Foundation, over $120,000 will be invested in the fulfillment of the Coalition’s quality of life plan for projects in the first year alone! Community gardens and orchards will be built, homes will be boarded up and/or rehabilitated, trees will be planted, and a small mowing business focused upon youth training and development will be implemented, among numerous other projects. Improving the quality of life in a neighborhood will be slow, but has huge potential to be transformative and long-lasting. Muncie Habitat is thrilled to have found excellent partners, supporters, residents and friends to join in this work!